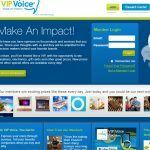 “VIP Voice”, found at vipvoice.com and a market research survey panel ofNPD Online Research, is a very different kind of survey panel. Whether that’s a good thing remains to be seen. As previously stated, NPD has been at least a somewhat reputably survey panel where you get paid to take surveys. Users at one point were able to earn a little extra with them, then they switched to a different system at which many still balk. VIP Voice utilizes the new and not improved system NPD switched to years ago, and it’s not very user friendly in terms of rewards. In fact, there are little to no surveys, standard or otherwise, for one. For another, VIP Voice does not offer cash. You read that correctly. No cash rewards. Instead, their compensation model is not really much of one. The issue that a vast majority of former users have is that although it is free to become a member, they earn points they can use to enter contests. These contests consist of sweepstakes and auction bids. The more points you earn the more chances you have to “win”. The surveys for which you might or might not always qualify earn you points in order to exchange them for contest entries. To add to the proverbial carrot at the end of the stick, VIP Voice offers a points doubler each time you complete a survey, again, a challenging task as it is. This means that if you earned 15 points for completing a paid survey, you get 30 on the next one and 60 on the next, etc. However, the fact is that you can earn all the points you’re able to make, but the chances of actually winning anything in sweepstakes are pretty much slim to none. This is the main point of contention for those who use other sites that actually pay with cash or gift cards. Before too long you will start to feel like all you’re doing is a waste of your valuable time when you see no rewards for it. Not only would you NOT win anything, the so called rewards are worth nothing and VIP Voice does not say how much you earn from any survey they send out. Big chances are you probably won’t qualify for many if not most of them, so trying to earn points for a practically non-existent sweepstakes win will be fruitless. Fortunately for the rest of the world, this bordeline scam is only available in the US and Canada, not so lucky for us. Worse, many who spent years saving up points for the unattainable big TV and vacation rewards say they either never won any of those things, nor anything at all. Insidiously, it seems any survey you get will feel like an ad after a while – that’s because they are! Not only that, you will be totally swamped with a barrage of spam by their third party clients who advertise to beckon you to join their scams. It all makes sense that this fly-by-night operation does not list a winners list anywhere online or privately, and they aren’t forthcoming on it anytime soon. If you enjoy taking surveys as a hobby to get gift cards and a few bucks here and there, you will find much better options anywhere, including the ones we recommend here. Since this awful excuse for a survey panel has such high visibility due to heavy national advertising, it suckers it many unsuspecting victims. Because they don’t charge to join nor ask for your financial or bank card info, VIP Voice just skates along the border of being a scam. So, we have to only NOT recommend it, much to our chagrin. Stay far away from VIP Voice if you value your time and efforts.